One More Go Around with Kuroda? The way Kuroda pitched at the end of 2013, and the beginning of 2014, I think a lot of us thought it might be time for the 40 year old from Osaka, Japan to hang ’em up at the end of this past year. Fortunately for the Yankees, Kuroda was able to turn things around as the year wore on, and that’s got me thinking… Would one more year be such a horrible thing? When the Yankees first signed Kuroda to a one year deal, on the same day that they traded for Michael Pineda back in 2012 (it wasn’t officially announced until three days later), I was ecstatic. I had practically been begging for them to do that to anyone within shouting distance back then, but I don’t think I actually ever expected it to happen. Thankfully, Brian Cashman decided to get out the check book and brought Kuroda on for $10 MM. Kuroda ended up sticking around for three pretty solid seasons, compiling a 38-33 record (he pitched well enough to win a lot more, but has always been plagued by poor run support, even in 2012 when the Yankees employed actual hitters), a 3.44 ERA and a 1.115 WHIP while making at least 32 starts every season he spent in the Bronx. Sure, he struggled at times, but for the biggest stretches of his tenure with the Bombers, he was a complete ace. 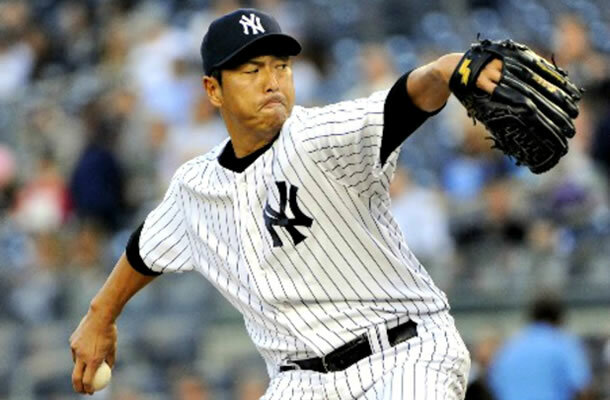 When Sabathia struggled, and literally everyone else got hurt, Kuroda was the rock. From June onward last season, Kuroda made 21 starts and put up a 3.29 ERA, and the league only slashed .231/.271/.339 against him. He also only gave up 145 base runners in 134 innings, which gave him a WHIP of 1.08. That’s winning baseball right there. During a season when the Yankees saw Sabathia, Masahiro Tanaka, Ivan Nova, Pineda and David Phelps all leave the rotation at some point or another with injuries, and the Yankees use seven other starters to fill in throughout the season, Kuroda was a godsend. Kuroda during his younger days on the Japanese olympic team in 1999. Bringing him back, as has been the case for the last few years, will depend on Kuroda’s desire to play, and the Yankees’ desire to pay whatever price the right-hander demands for his services. Kuroda’s salary rose from $10MM to $15MM in 2013, and then to $16MM for the 2014 season. It’s hard to say, at 40, and coming off of the season he had, if he should be getting a raise, the same pay or a slight pay cut for the roster. On one hand, he was great last year, and on par with his numbers from his other two seasons in pinstripes. On the other hand, he’ll be 40, which is rarified air for Major League starting pitchers. You can count successful 40+ year old starters on one hand. Off the top of my head, Bartolo Colon is the only one that I can think of that is currently in the league. If Kuroda decides not to retire or go back to Japan (no word on that yet, but he has seemingly considered it the past couple of off-seasons), I would offer him another one-year deal worth $10-12 MM and call it a day. I don’t think we should be breaking the bank, or gambling too much money on his aging arm, but it would be a real shame to see him pitch for another Major League team in 2015. What do you guys think the Yankees should do?